This one doesn’t make a whole lot of sense; why was the content dropping dramatically before n = 1? 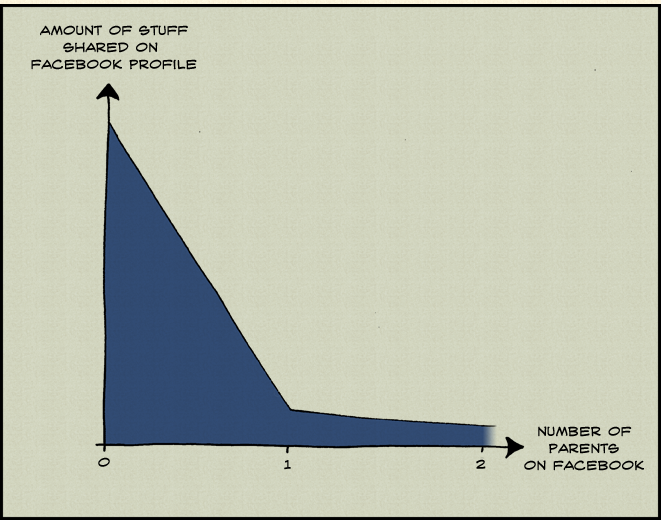 If anything, the graph implies that the parent joining Facebook actually stopped the decline of shared content. Actually, it really is continuous. Although the number of __profiles__ of parents is discrete, their activity may vary between 0 and 1. Hence, in the graph, 1 could imply one parent, that is always logged in, and does whatever you are supposed to do on facebook or two parents that are both a bit active in that network. However, in that case, the graph should be differentiable. It is curious how you can get more than two parents there. Perhaps if you are adopted or something? Still no. The number of parents on Facebook is still a discrete variable, for either one of two definitions of “on Facebook”: a) having an account, or b) being logged in. In both cases, the variable would vary over time, but it would still be impossible to have a fraction of a parent on Facebook either way. The main difference would be that in the case of b, the variable would change a lot more often. In order to treat it as a continuous variable and make sense in the way you suggest, then you could change the x-axis to involve time in some way (e.g. taking the time-average) and then something like fraction of parent-hours on Facebook (or average hours spent by parents on Facebook per week, introducing a constant factor of 168 to the x-axis numeric value) would be much more appropriate. I think the “Amount” is plotted for 0, 1, and 2 parents, with a line drawn between them. I suspect that a (amount shared) value would be higher for n > 2 if d (divorce) = 0. Otherwise it would continue to go down. @Adrian: thats brilliant, so all we have to do is force anyones parents on facebook 1 minute after they join and everything will be shared! I think it’s just based on plotted points for 0, 1, and 2 parents. The line and area are filled in to connect the dots, so it’s not really giving a value for 1.43 parents, since that’s meaningless. Possibly this is based in perception of parental hard-assed-ness. An easy going parent is a .5 , where as two roman catholic parents count as 3 total. Step Parents, Gossiping Aunts, parental siblings. It’s pretty variable. My biggest concern is the differentiability of Facebook. I see that as the number of parents on FB causes children to share less of their personal stuff such as their smexy photos and the like. So, lets get this straight …. the stuff below the curve is what we know. Above the curve is the stuff we know we don’t know, plus the stuff we don’t even know we don’t know, the stuff we know that you don’t know, and the stuff that (believe it or not) we don’t even want to know. And, on the z axis is the stuff that your mother can work out for herself without any recourse to Facebook whatsoever. Not to mention the stuff that we know that you don’t want anyone else to know! …. this is a comic. not an equation. This is Luke Surl (Luke’s URL). Many of the comics are equations.